Let your little one bounce and sing-along with this exciting Vtech bounce and discover friendly faced frog. Encourages your child to press the buttons and learn numbers, animals and colours with the fun-filled activity packed handbar, whilst the roller ball enhances motor skills and hand eye co-ordination. 2 modes of play – numbers and music; 4 buttons teach numbers, animals and colours. 14 melodies and 5 sing-along songs; 1 motion sensor activates funny bouncing sound effects. General information: Size H40.6, W50, D15cm; Weight 3000g; Batteries required: 2 x AA (included); For ages 18 months and over. EAN: 3417761463031 WARNING(S): Only for domestic use; To be used under the direct supervision of an adult. This toy does not provide protection. 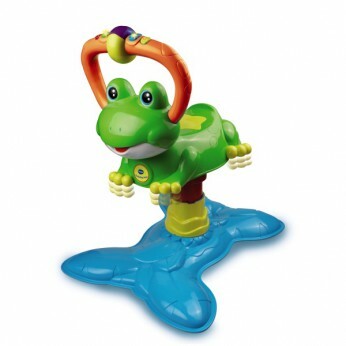 This toy costs approximately £29.99 (for the latest and best prices make sure you check our retailer list for the VTech Bounce and Discover Frog above). In our review of VTech Bounce and Discover Frog we classed it as being suitable for ages 1 to 3 years but recommend you check the manufacturer specific advice before purchasing.